Sorry, we are currently sold out of 'Barbie Video Girl Doll'. Your child will have a blast recording her own movies with the Video Girl Barbie Doll. Barbie's built-in camera allows you to record video and audio from Barbie's point of view. Kids aged 6 and up will love playing with Barbie and shooting videos that they can edit with free, exclusive software. Record video from Barbie's point of view with the Video Girl Barbie Doll. View larger. Edit your Barbie footage to create movies with music, sound effects, transitions and more. View larger. With Video Girl Barbie, your child can play filmmaker by shooting real videos. Barbie's necklace features a camera lens that shoots from her point of view. You can watch the recordings in real time and play them back on the color LCD screen that's conveniently located on her back. Barbie's controls allow up to 25 minutes of recording at a time. You can scroll through your clips and delete what you don't want to use. With the USB cable, you can even transfer clips to your computer. Barbie's playback mode doesn't include audio, but you'll be able to see and hear the clips when you transfer them to your computer. 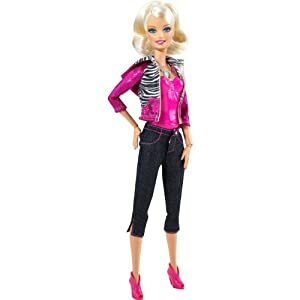 Barbie comes out of the box in denim jeans, a trendy print hoodie with shimmery pink fabric, and matching pink ankle boots. You can hold her while you're recording, or use her jointed knees, elbows, and hands to pose and point her toward your film set. Whether she's documenting her birthday party or filming a dramatic epic starring her favorite Barbie dolls, your child will love the creative possibilities of Video Girl Barbie Doll. Plug Barbie into your Windows machine with the USB cable and download the free exclusive editing software that allows you to turn your clips into movies with music, sound effects, graphics, and transitions. The software comes preloaded with soundtrack music that fits most any genre--from romance and action, to comedy and drama. Kids will love integrating the Barbie-themed transitions, opening screens, and closing credits screens into their films. With Video Girl editing software, you can even connect Barbie to your computer for live video display. The software is intuitive and easy to use, but younger children may need help learning the tools. After your child is done editing her film, she can save the file and share it with her friends. Video Girl Barbie Doll with video camera inside, USB cable, instruction manual. Doll is Windows/Mac compatible, but editing software is Windows compatible only. Lights, BARBIE®, action! Barbie® doll is not just a doll, she's a video camera, too! A real video camera inside Barbie® doll features a camera lens hidden in her necklace and a video screen on her back that allows girls to record and view movies instantly. It's moviemaking from a Barbie® doll's point of view—literally!